The Hidropark in Mallorca is well-known for its various slides, e.g. Line, Soft Track and Slice Race. A day of wicked water-park action awaits you. Get to know this versatile water park in Mallorca with its large number of attractions and water slides. Spend an afternoon or even the whole day at Hidropark and have a blast on the various slides like the Kamikaze, the Line, the Soft Track slide or the Slice Race Slide. With so many slides, it's impossible to get bored - there are slow and fun slides if you're scared and super-speedy ones if you want to get a rush. Give the spiral slide a whirl! Kids go mad for the Children's World, there's a water castle in a big pool, a Mini Park and Floating Water Balls (that you walk in). Play a round of paintball or mini golf in Hidropark Alcudia. There's something for everyone in the park. If you want to grab a bite, you can get fed and watered and regain strength in the self-service restaurant with freshly prepared hot and cold dishes. Pop to Bar Neptuno and have a barbecue, cocktails and snacks. Wimpy is offering ice cream and sweets. This water park takes care of your every need. Please choose a date when booking. 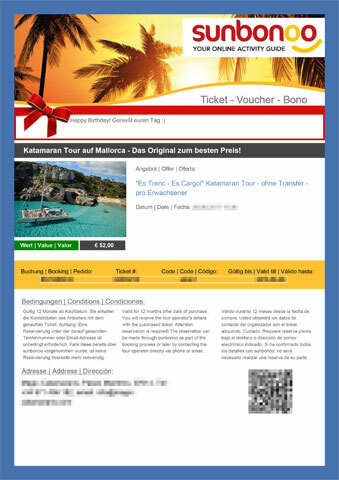 The ticket is valid for 14 days within the chosen date. Please note: You are not allowed to bring your own food or drinks to Hidropark. A fun-filled day for the whole family awaits you at the Hidropark in Puerto de Alcúdia. Experience a day of exciting slides for young and old and much more! A Mallorca holiday with the family can be so much more than just beautiful beaches, walks through marvellous mountain towns or late-night dinners on terraces. Have an action-packed day at the full-of-fun Hidropark in Puerto de Alcúdia. There is plenty to check out for the whole family. Find over 40,000 square metres of slides, water games for children and awesome activities on land. The main attractions of the water park are the slides. There is the Kamikaze, a very fast slide that takes you straight to the pool, the Line & Line, which consists of different slides next to each other: a special challenge, you slip side by side and try to arrive at the same time as your buddy! There is also the Soft Track, Spiral and Slice Race, which will surely put a smile to your face. It doesn't stop there, for the youngest there is the Children's World area which is made up of a shallow pool with three smaller slides, which guarantee safe swimming and paddling. As well as that, there is the mini-park, a climbing frame in a swimming pool which invites you to splash around. In another pool, the Wave Pool, you can plunge into the waves or simply drift along with the water. Do you want to know how it feels to walk on water? Then, pay attention because this attraction promises to give you that and more. The Floating Water balls let you walk on the water or crawl more like as you'll soon come to realise it's much harder than it looks. If you're not a big fan of water, you can play a game of mini-golf. A green landscape packed full of holes for you to conquer. If you're peckish, pop along to Café Neptuno and have a snack or a drink. There is a buffet and BBQ area. The Hidropark is one of the top things to do in Mallorca and guarantees enjoyment for the whole family! The slides are the best. Power great fun. A Water Park in holiday should be. Die Rutschen sind das beste. Macht großen Spaß. Ein Tag Wasserpark im Urlaub muss sein. Normally I do so many people on a pile not so much. But the slides are amazing, so it was a total of a great day. Only the ride on the bus to go a bit annoying. Better to hire a car, which costs just 30 € a day. Normalerweise mag ich so viele Menschen auf einen Haufen nicht so gern. Aber die Rutschen sind der Hammer, deswegen war es ingesamt ein super Tag. Nur die Fahrt im Bus dahin nervt etwas. Man sollte besser einen Mietwagen nehmen, der kostet nur 30 € am Tag. Unfortunately, we were in the middle of the peak season. Had unfortunately something pending. But has paid off. Of the slides we could not get enough. Was overall a great day. Wir waren leider mitten in der Hochsaison da. Mussten leider etwas anstehen. Hat sich aber gelohnt. Von den Rutschen konnten wir nicht genug kriegen. War insgesamt ein toller Tag. Kamikaze and Slice race are the best slides. Everything went well, again any time. Kamikaze und Slice race sind die besten Rutschen. Alles gut gelaufen, jederzeit gerne wieder. If your time needs a little rest before the children, booked a day at the water park. Especially this we can recommend. Next year we test the other Mallorca. Wenn Ihr mal ein bisschen Ruhe vor den Kindern braucht, bucht einen Tag im Wasserpark. Speziell diesen können wir empfehlen. Nächstes Jahr testen wir die anderen auf Mallorca. You're reviewing: Tickets for Hidropark in Alcudia - See North Mallorca and have a blast on the super-slides. How do you rate this product?